DILLSBORO, N.C. — On Saturday, August 18, 2018, Dillsboro will celebrate the Appalachian Women's Museum with Art in Monteith Park, a daylong arts and crafts festival. Among the more than 40 booths of handmade, local arts and crafts, you will find jewelry, pastels and oil paintings, candle making, needle crafts, soap making, glass art, chair canning, wood crafts and much more. Entertainment will include “The Maggie Valley Band” playing a blend of old-time mountain, Americana and folk music and the J. Creek Cloggers. 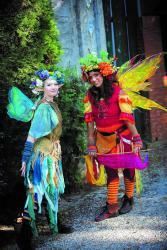 This festival has a special draw for children with “Spark the Fairy” and friends. Spark is a fire and nature fairy who travels through the country bringing joy and sparkles, love and wonder to those who cross her path. She brings with her fairy best friends Dew Drop, a Joyful Pixie and Sinbad the Fairy Protector. Together they restore the belief in magic, beauty fairies and fae folk for the young and young at heart! Also there will be balloon entertainment and games to play. Festival food provided by NGN 52 wood fired pizza, The Chili Chomper authentic Mexican and Frozen Monkey shaved ices. On the outskirts of Dillsboro is a mountain treasure, “The Monteith Farmstead.” The farmhouse was built in 1908 on sixteen acres alongside Scotts Creek. It has been newly refurbished as the home to the Appalachian Women's Museum. This will be the first museum dedicated to Southern Appalachian women. The museum has been placed on the National Register of Historic Places. The Appalachian Women's Museum will be open to welcome visitors who want to get an idea what life was like back in the day. In addition, there are a series of easily accessible, interpretive nature trails along the shoreline of adjacent Scotts Creek. Also, you will find a children's playground. Plan to bring chairs and spend the day. Free admission to festival and museum. $3.00 parking at event. The festival starts at 10am, going through until 4pm.